I’m house #23 on the Holiday House Walk this week. If you’re heading over from Just Destiny … welcome! You can start the tour with the very first house by clicking here. My Christmas tree is a little different each year. In 2016 it was pink, this time I opted for mixed metallic tones. The tree itself is new; it has a heavier flocking than last year’s Christmas tree. I gave my other tree to my daughter – along with my pink ornaments because she’s been yearning for a pink tree. My Christmas tree is entirely inspired by an adorable vintage Santa ribbon I found at a local boutique that’s been in business longer than I’ve been alive. Ladies from all over Chicagoland journey to The Little Traveler for weekend shopping sprees. It’s a huge store housed inside an historic mansion. Once I settled on the ribbon, which the sales associates had to remove from the display tree for me, decorating was just a matter of matching the gold and bronze tones of the ribbon. 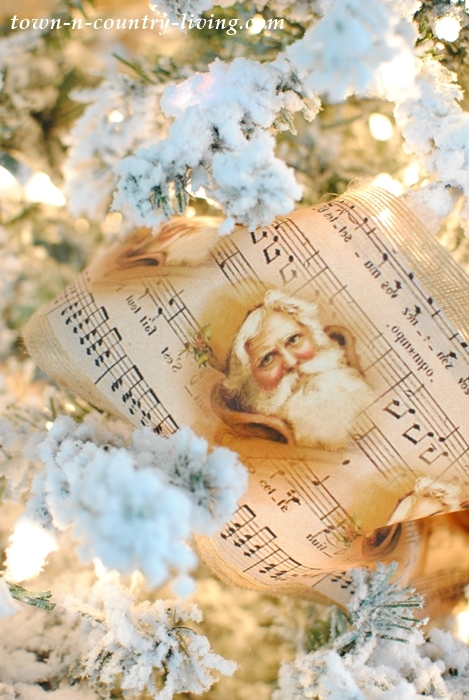 I love to weave the ribbon in and out of the tree so it looks like it’s billowing in spots. Rather than a tree skirt which ends up getting covered in presents, I opted for a much larger furry area rug under the tree which can still be seen after presents are strewn about. 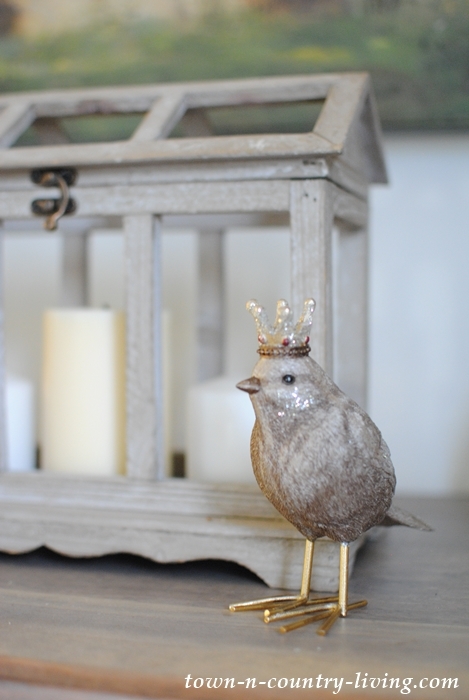 Little birds with French crowns are new to this year’s Christmas tree. Mimi, my grandmother, always had birds on her tree. 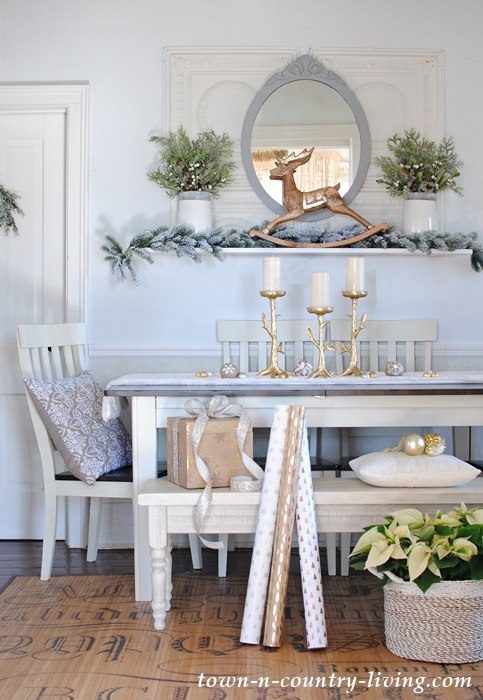 The first room on my country style Christmas home tour is the dining room. Last year this area served as a living room. I swapped the living and dining rooms to create more space for dining when friends and family are over. When not in use, I keep my new dining table along the wall to allow for better traffic flow in the room. 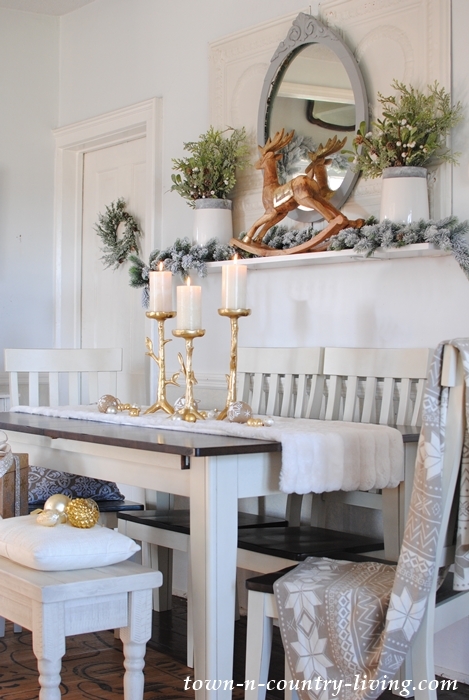 A soft and fuzzy table runner creates a cozy base for gold candle holders. 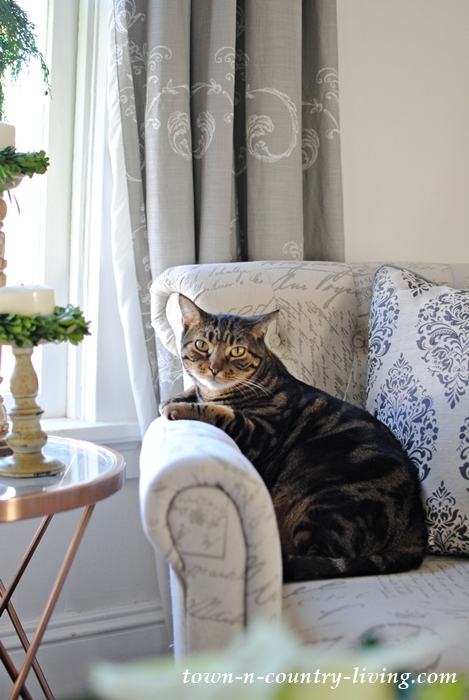 Bella decided she liked the warmth of the knitted winter throw draped over the dining chair. My kitties are always photo-bombing my pictures. Bella needs a pretty red ribbon around her neck for the holidays. My dining table gets moved to the center of the dining room when in use. My gold and crystal holiday table is set for six people, but the table expands to eleven feet to seat 12 to 14 people comfortably. Hubby recently hung the new chandelier that I found at Wayfair. 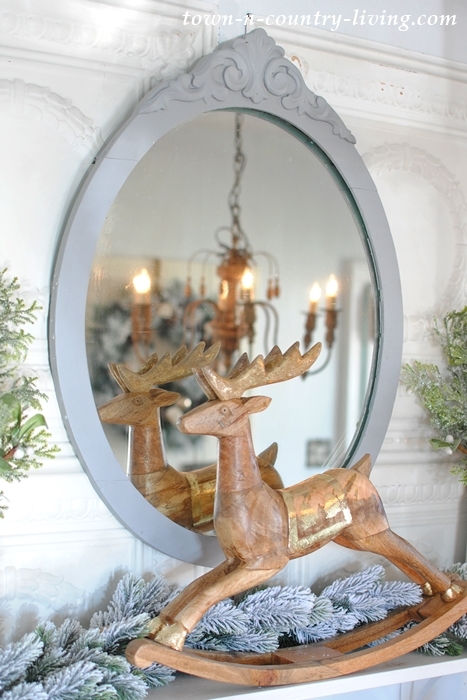 A wooden rocking reindeer cried out from the shelves of HomeGoods for me to take him home. He has just the right touch of gold leaf on his saddle, antlers, and hooves. Stoneware crocks at the end of the dining room overflow with various greens and creamy poinsettias. 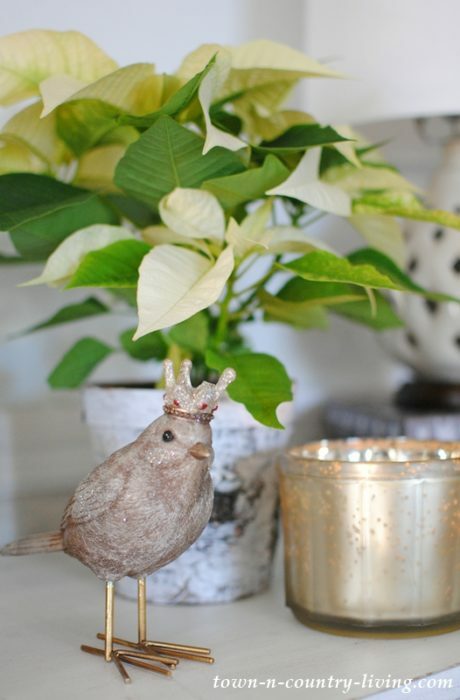 Traditional poinsettias are a must in my home at Christmas. 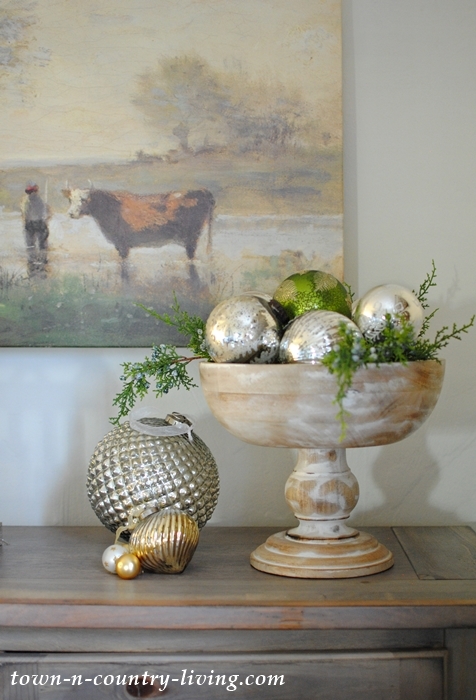 My country style Christmas home tour wouldn’t be complete without some remembrance of the true meaning of Christmas; the birth of Jesus, Lord and Savior. If you believe Jesus is the Son of God, the holiday carries an amazingly life-changing message for you and the world! 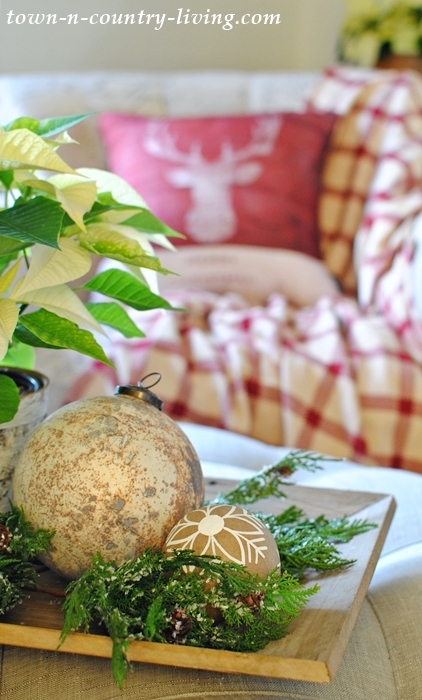 Simple ornaments beneath the sign wear festive white motifs. 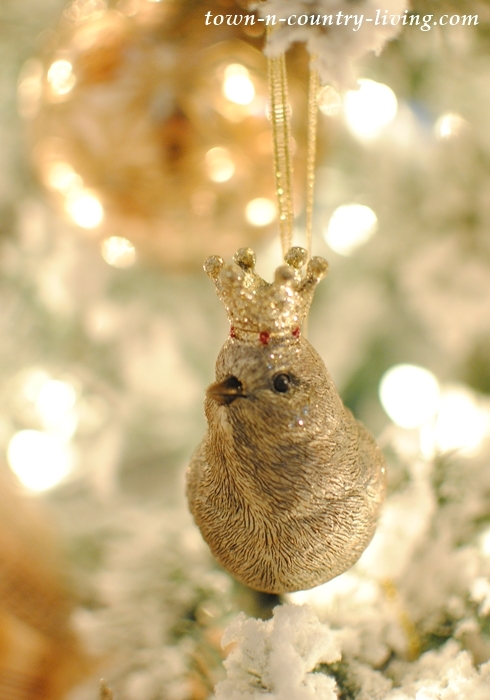 Remember the bird with the French crown dangling from a snowy branch of the Christmas tree? I have a few more placed about the house. 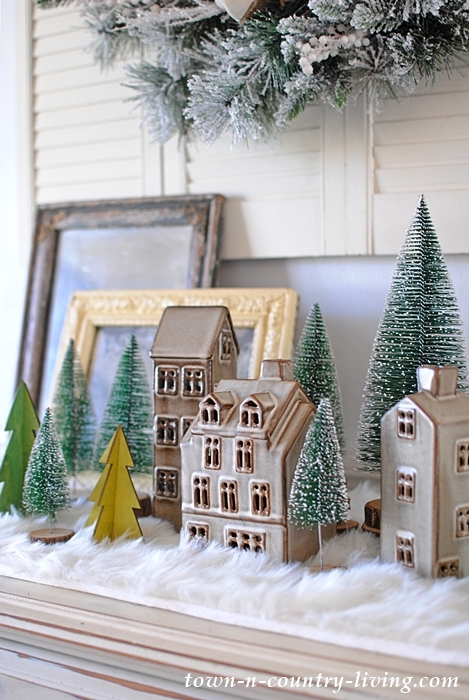 A little Christmas village nestles atop a snowy runner on the dining buffet. 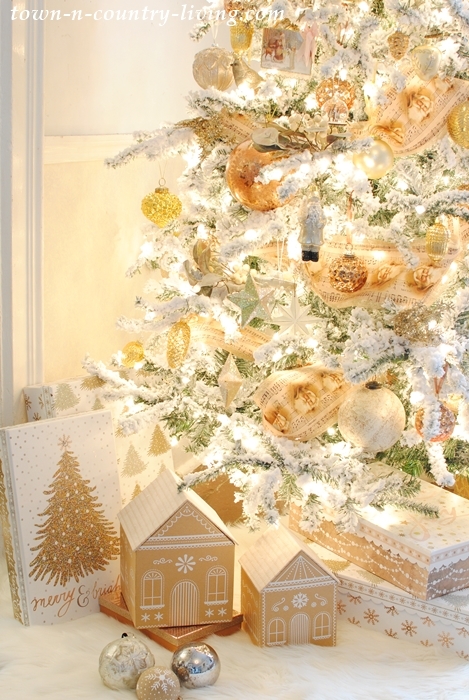 Wooden Christmas trees intermingle with bottle brush trees to create a cozy scene. 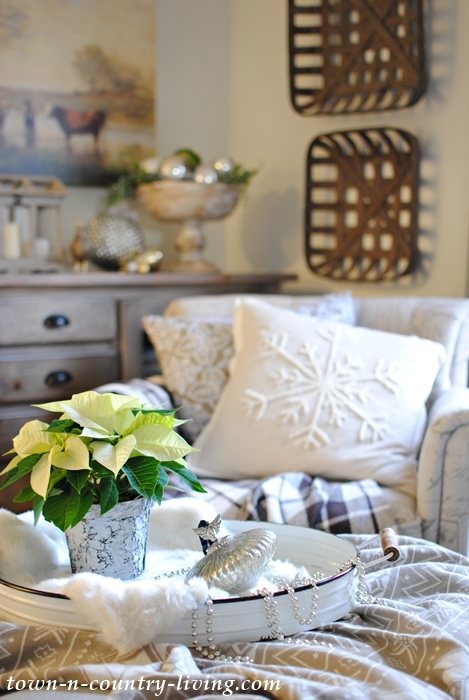 Next up on my country style Christmas home tour is the sitting room. This is the room that previously served as the dining room. Its small size lends itself perfectly for cozy conversation. The country canvas scene is new to the space. A snowflake pillow can be used after Christmas has come and gone – at least until the snow stops flying. 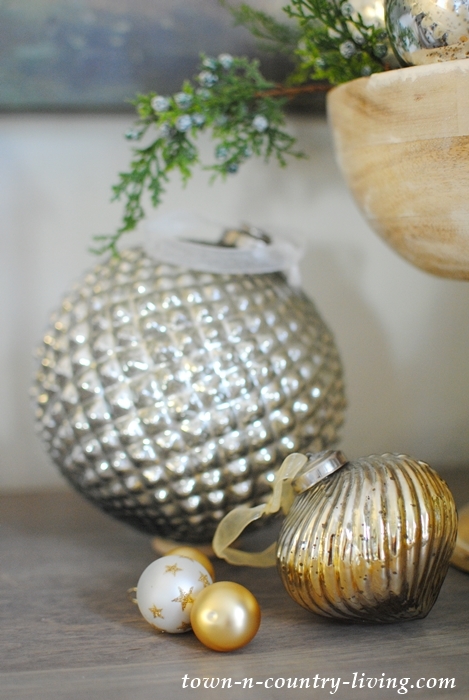 Large glass ornaments fill the wooden pedestal bowl. 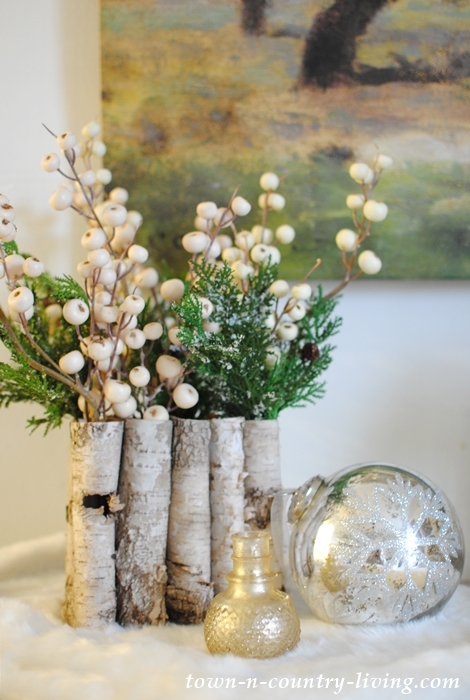 Sprays of Christmas greens and berries fill a birch bark vase. Another French-crowned bird graces the sitting room. 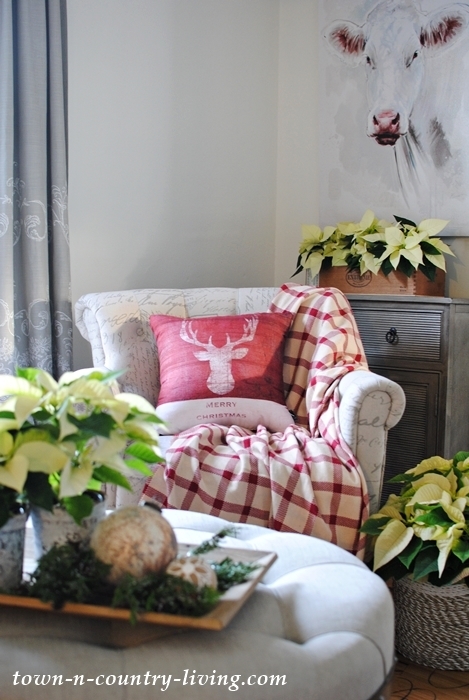 Just a touch of red is sprinkled into the room with a cozy throw and deer pillow. Puddy looks guilty sitting on the script chair. 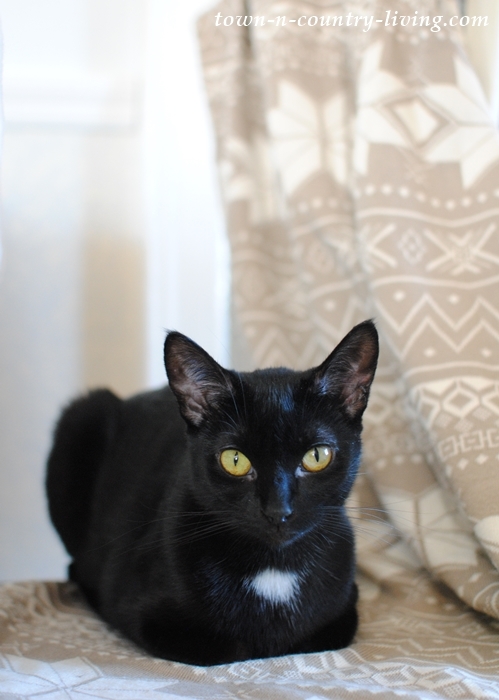 We have four indoor kitties – all strays that we rescued. We also feed three outdoor feral cats that stay warm in our shed during the winter. Puddy likes to look out the window at the squirrels gathering nuts from our black walnut tree. 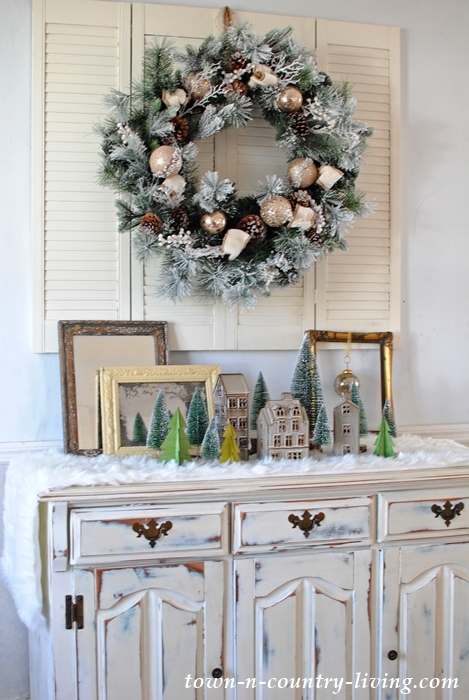 My cozy Christmas mantel in the sitting room features a rustic bark wreath with an elegant gold bow. 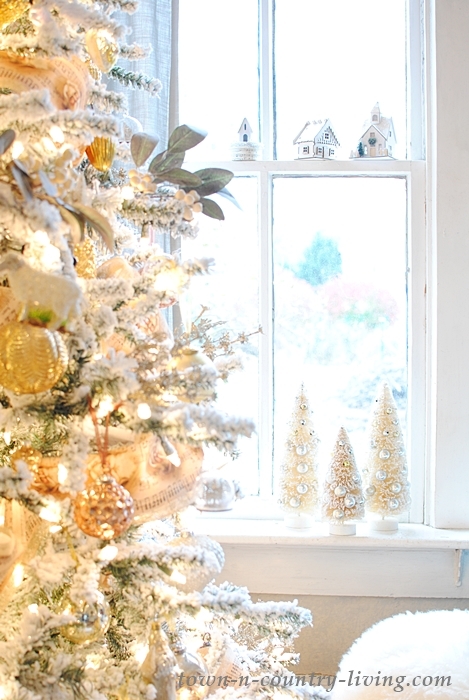 The golden glow of the Christmas spirit lives in our old historic home. I’ve always loved the special magic of Christmas. 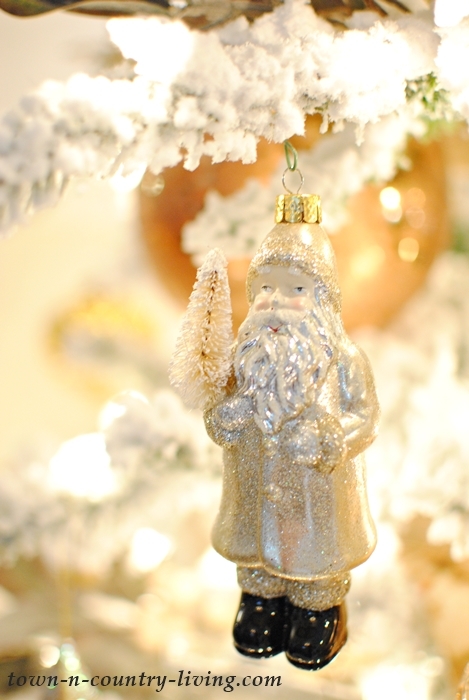 On Saturday I’ll show how I created a special spot to relish the joy and wonder of the holiday. 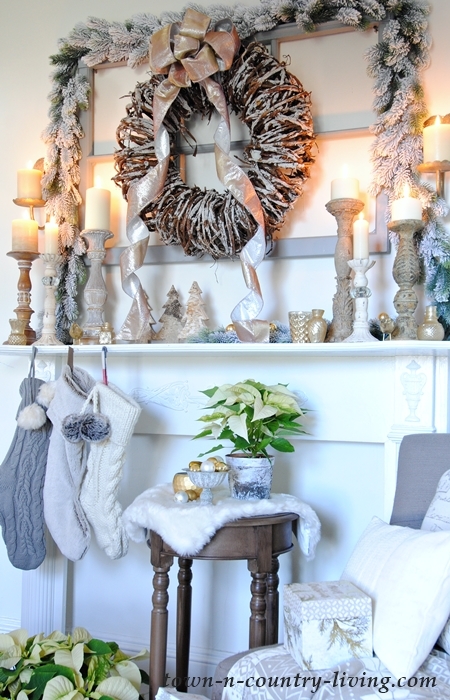 And on Tuesday and Thursday next week, I’ll show more of my home decorated for the holidays. 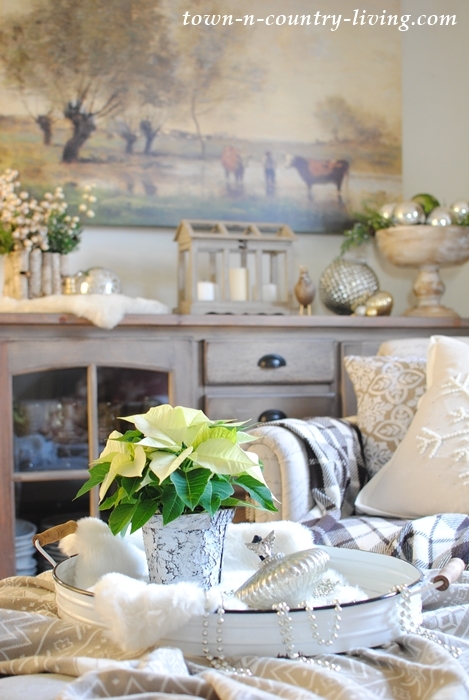 I hope you found some peace and inspiration from my country style Christmas home tour. Next up is the lovely Laura from Duke Manor Farm. I truly love her home and think you will too! It looks beautiful! Thanks for sharing! I’m so glad you enjoyed it. Thank you so much for visiting my holiday home! Oh my goodness. So gorgeous Jennifer! I love all the little villages. Perfect touch! Thanks Destiny! Your home is gorgeous as well! Love the new art canvas in that cozy sitting area. 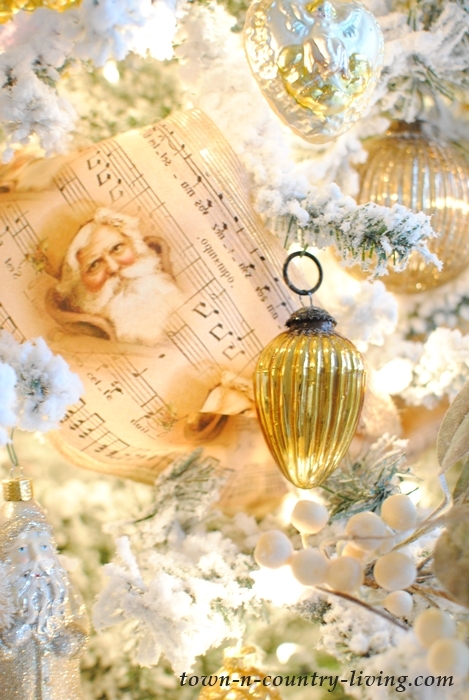 Your Christmas is always magical. 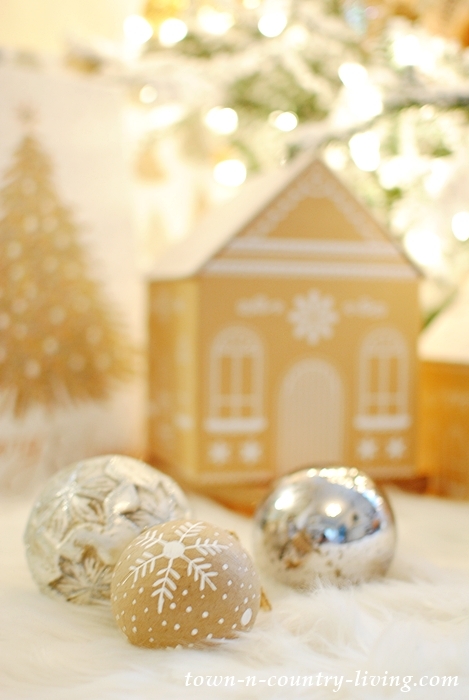 I always enjoy seeing your beautifully decorated home for the Holidays! Each room is simply enchanting!!! Merry Christmas Jennifer! Thank you, Shirley! That means a lot coming from you. I always appreciate your visits! Beautful! Thank you for sharing. 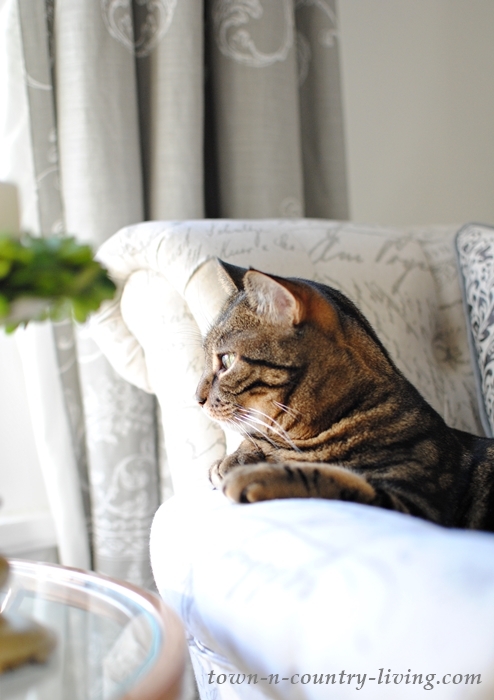 Love the photos of the cats. QUESTION: Are you still pleased that you switched dining and living rooms? I am considering this and would appreciate any input you would share! What a beautiful post. The white is so calming. Thanks for sharing. Thanks, Eve! I agree with you that white is calming – and peaceful! Jennifer, your holiday decor is simply magical! Love the colors… The bitty kitties are precious. Do the kitties bother the poinsettias? Your home positively sparkles! 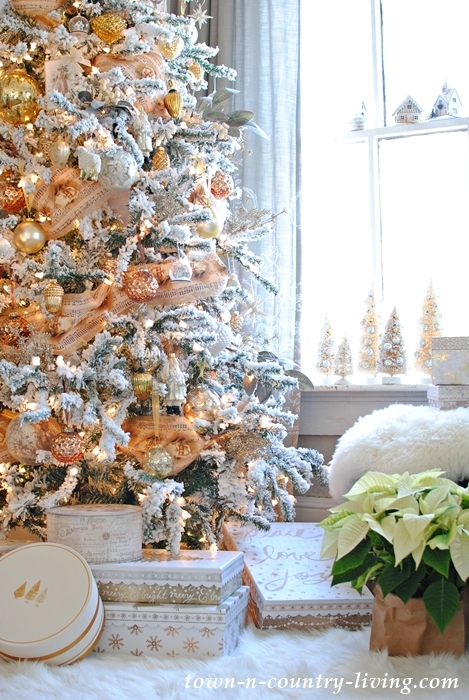 I love that vintage Santa ribbon and the furry rug under the tree. Sushi wants a play date with Bella! Thanks so much, Kelly! Bella wouldn’t know what to think of Sushi but it’d be fun to watch them interact! Thanks so much, Jen! I love what you did with your former dining room. Your home is always gorgeous! Love your tour Jennifer. Just gorgeous. Love love your new tree and the colors you did this year. Beautiful. This was so peaceful Jennifer, close to heavenly, thank-you for sharing your lovely home. Thank you, Lynda! We love our kitties!! Everything looks so, so lovely Jennifer! Your tree is pure magic. Wishing you a most wonderful holiday season. Thank you, Shannon! Your home is lovely as well. I really like your layout. Happy Holidays! Jennifer- i though your pink tree last year was my favorite but i just love this years tree! 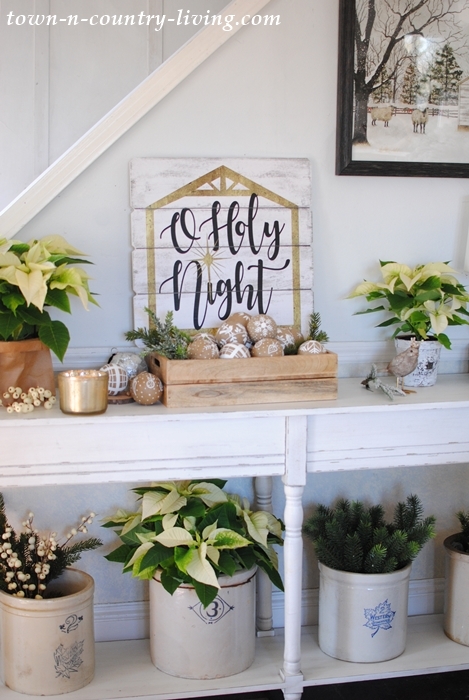 i love how the real meaning of christmas is included in your holiday decor. thanks for sharing your holiday home. happy holidays! Thank you, Laura! Last year’s pink tree was special because it was a tribute to my mother. But my daughter was very happy to get all those pink decorations this year! I wonder when her hubby is gonna put the brakes on all the pink. Ha! Hi Tamara! Don’t you love those birds? 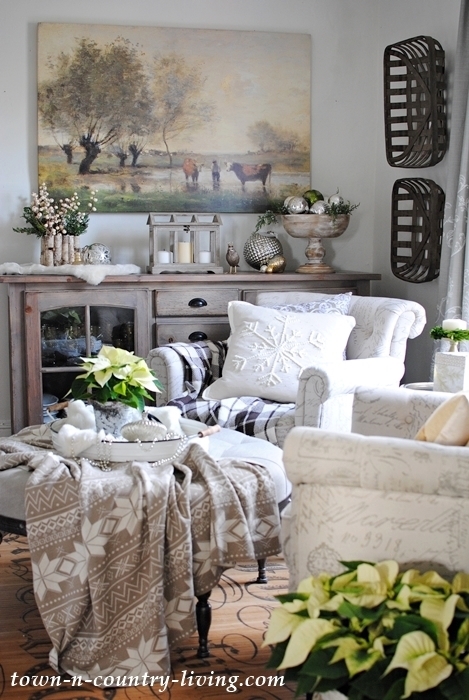 The Cozy Cottage store sounds like one I’d want to visit. Funny story about your kitties! I’ve sometimes found bottle brush trees in weird places but at least they leave the big tree alone. I took care of my daughter’s cat for a while and he’d ALWAYS climb the tree. I’d find him napping on the branches inside the tree. Just those two little eyes looking out at me like he was defying me to try and get him out. Everything is simply gorgeous. Stunning Photos and decor. Thank you Marty! I always appreciate your visits and comments! Amei a decoração denatal. Tudo lindo e inspirador. Your home is so lovely! 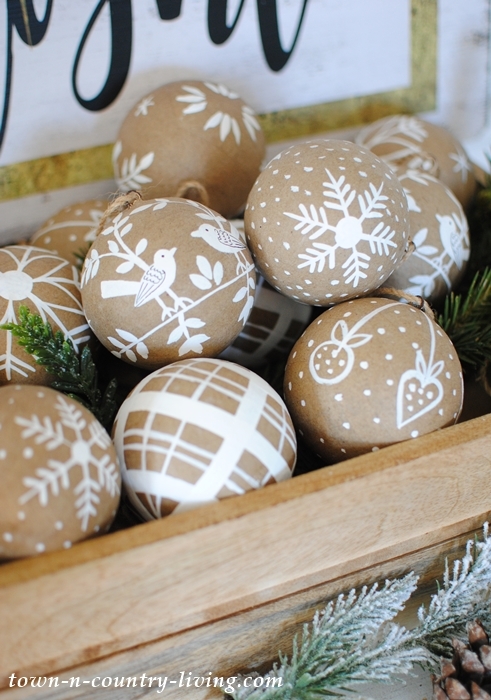 Can you tell me where you found those simple kraft paper and white ornaments? I love them!!! Thank you for the beautiful Christmas tour. You have done a beautiful job and I love your canvas painting too. Thank you, Marijean!! I hope your holidays are peaceful and filled with joy! Thank you Kristin! I’m heading over to your holiday home as soon as I finish responding to emails! Can’t wait to see it! So glad you enjoyed the Christmas tour. The boxes under the tree are all from HomeGoods. They rotate stock frequently but seem to carry these every year. You’ll find them by the holiday wrapping supplies. They’re really sturdy and aren’t very expensive. I seem to buy a couple more each year! 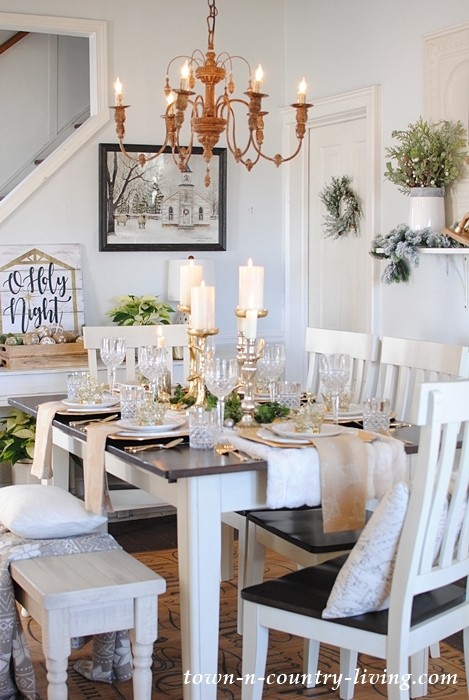 This is the most stunning Christmas home I’ve ever seen, I’m afraid if I were to visit you I’d be a horrible guest, ohhing and ahhhing over all of your gorgeous decor! Your tree is beyond breathtaking! I want everything and I don’t blame you for making the store take that ribbon off of the display tree – WOW! 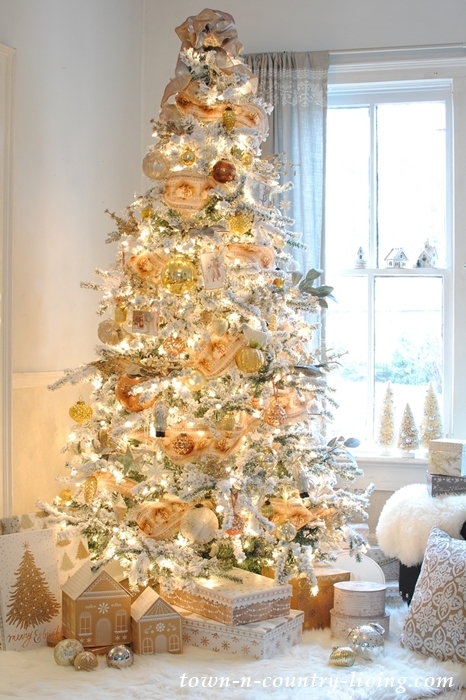 And, I too am inspired by you for my decor for next year… I simply LOVE the brown paper ornaments with the beautiful contrasting white – my eyes popped! <3 Merry Christmas lovely friend! xoxo Enjoy every second with your beautiful family! 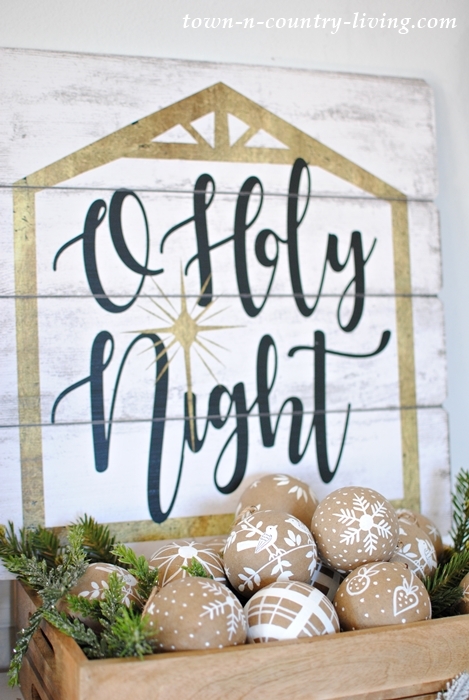 Are the ornaments by the Oh Holy Night pic purchased or diy? I don’t know how I did it but I missed your Christmas decorated home. Beautiful. I love your tree this year, again. 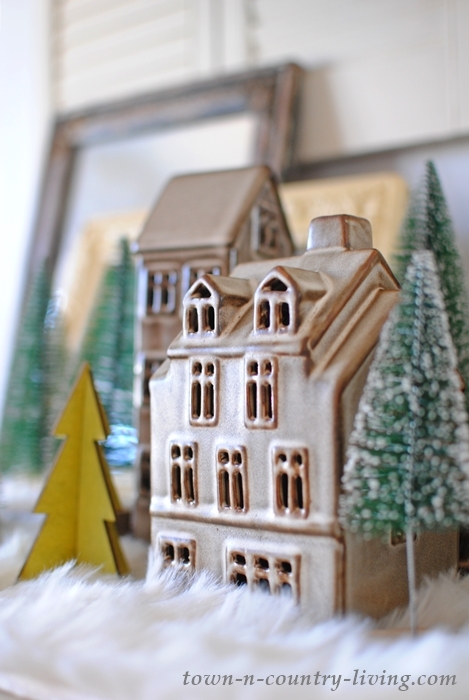 I would like to know about your ceramic Christmas village. So glad you didn’t put it away and showed it again, which is how I linked to your Christmas home. 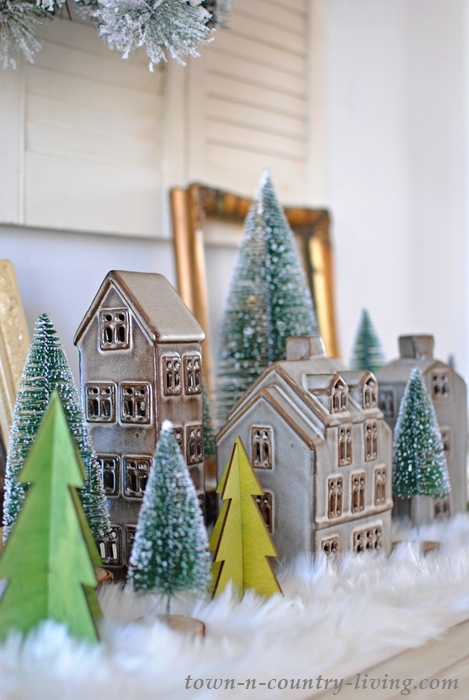 Did you include information about your Christmas village at some point? Like to know your source if you would be kind enough to share. By the way, I have one of your graphic chairs in my master bedroom now. love it. Took an inch off the legs so it would sit a little lower. I am a little short on both ends. I may paint the legs also. Still trying to decide. Have a wonderful Valentines Day. Christ is the giver of true Love. Please may I know where to purchase the lovely lg cow picture posted here?